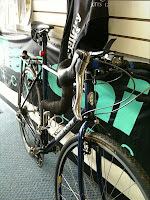 stickboybike: Dura Ace Volpe and don't buy that plastic Tiagra bike! Dura Ace Volpe and don't buy that plastic Tiagra bike! Shop owner Kirk, at Simplicity Cycles has a really unique Volpe which he uses as his commuter bike. 2009 Bianchi Volpe. Kirk removed the stock groupo and wheel set and installed Dura Ace components and a classic Mavic Open Pro hoops. His favorite Ritchey compact crank and Fizik Arione saddle round out the back half of the bike. Kirk will sell you on the benefits of a quality steel bike before putting you on a rough riding sub $1000 aluminum road bike. 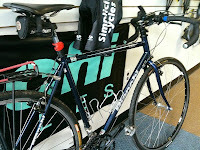 Steel is real to Simplicity Cycles. Dollar per dollar when comparing and selling similarly equipped low to sub-mid range road bikes; (one steel and the other aluminum) they'll weigh within a pound of each other. That pound is typically made up of the weight of the frame and the components--not so much the wheel set. A pound of non-rotational mass (bike minus wheels) isn't going to affect the average cyclists on a 1-2 hour road ride. A pound at the wheel set, you'll feel that over the course of the ride because you have to work harder to keep the heavier wheels spooled up. I have a dealer in TN that knocks it out of the park with the Vigorelli using the 'test ride comparison'. That comparison is the $1800 carbon road bike vs the Vig. Unless that customer has a gun to their head, being told to buy the carbon bike (Tiagra component spec'd); a one hour test ride on the Vigorelli and the $1800 carbon bike will yield positive results. The winning result of the one hour test ride 9 out of 10 times has been for my TN dealer-- the Vigorelli. The Reynolds 631 tubing of the Vigorelli provides a very lively, controlled ride with minimal chattering as you pedal across the tar chip country roads this side of the Mississippi. The Vigorelli is spec'd with a full Shimano 105 groupo, crank w/an Ultegra rr derailleur...I don't need to explain here why this combo would shift better than a full Tiagra groupo and FSA crank, do I? Not to mention on this price level, the steel bike will last longer than the carbon frame bicycle. The sales don't lie, the test ride won't be denied.